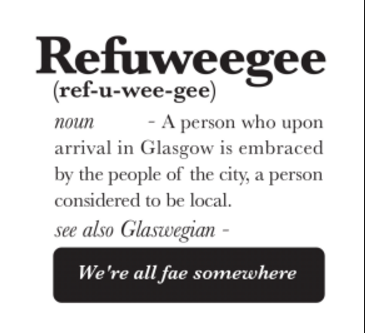 Refuweegee is a community-led charity set up to ensure that all refugees arriving in Glasgow are welcomed to the city in true Glaswegian style. Their aim is to provide every Refuweegee who arrives in the city with a community built welcome pack. Each pack will contain three categories of items; essentials, Glasgow welcome and ‘letters from the locals’ and as a result of the final category, each pack will be completely individual. ‘Letters from the locals’ are the heart and soul of the packs. These can be in the form of postcards, letters or post it notes, as long as the words are welcoming and kind then it’s what they’re looking for. These letters could also be used to advertise the programmes and free activities your organisation can offer to them. Help Refuweegee to make sure that upon arrival in Glasgow people are left in no doubt as to their acceptance, their safety and their future. Write your letter today and drop it into any Oxfam store in Glasgow where you will find a Refuweegee drop box or post it to; Refuweegee, PO Box 7639, GLASGOW, G42 2HD. Visit https://refuweegee.co.uk for more information.